Congratulations to our winner: @Donna_Marie1982 – have fun with your travel kit! 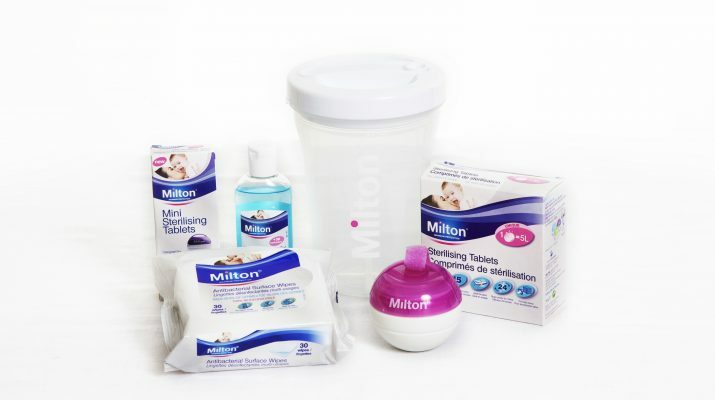 This month we’re delighted to team up with Milton, the leading experts in sterilising to give away a fantastic Milton Travel kit – perfect for holidays! The Milton Solo is a single-bottle steriliser that can be used either in the microwave or with cold water. It can be used to clean and sterilise bottles, teethers, plastic toys, breastfeeding equipment and other small baby equipment from 2 minutes in the microwave and in 15 minutes for cold water. It is ideal when travelling or away from home. The Sterilising tablets can be used to sterilise all breastfeeding equipment and baby feeding accessories : breast pump parts, baby bottles, soothers, teething rings, small plastic toys, plastic cutlery & weaning bowls. Milton’s Antibacterial Surface Wipes are a practical and quick way to clean, disinfect and freshen all surfaces in the home, from high chairs and worktops to bathrooms and potties. To be in with a chance of winning this fantastic prize simply fill in your name and email address below then Like and Follow @babyeblog and @milton_baby on Facebook, Twitter and/or Instagram and share the competition post. Good luck! Competition closes midnight Tuesday 5th September. UK entry only. A winner will be picked at random. The winner will be published on this page within 48 hours. The winner will be contacted by email or twitter and the prize will be sent out within 3 working days. No alternative prize is available. Prize contains the items as described above. No cash alternative.